Sonam Kapoor ; born 9 June 1985, Mumbai, Maharashtra, India) is an Indian film actress who appears in Bollywood films. She went to school in Mumbai at the Arya Vidya Mandir school in Juhu and then enrolled in the United World College of South East Asia to do her International Baccalaureate. She is fluent in English, Hindi and Punjabi, and has received training in classical Indian and Latin dance forms. 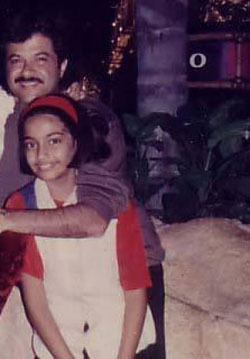 Before starting her career off as an actress, Kapoor worked as an assistant under Sanjay Leela Bhansali, and assisted him during the making of his film, Black (2005). She made her acting debut alongside newcomer, Ranbir Kapoor in Bhansali's Saawariya (2007), which failed to do well at the box office. Her performance was opened to good reviews by most critics. In 2009, Kapoor appeared in Rakeysh Omprakash Mehra's Delhi-6, opposite Abhishek Bachchan. The film flopped at the box office and received mixed reviews by the critics, but her performance was highly praised. 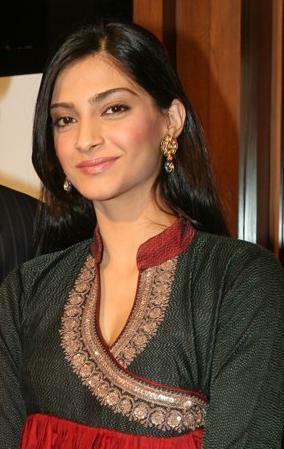 Critic Rajeev Masand commented, "Sonam Kapoor is the revelation in Delhi 6. She's a firecracker performer, instinctive and uninhibited in what isn't even a conventional female lead"
In 2010, she appeared in Punit Malhotra's I Hate Luv Storys opposite Imran Khan. The film went on to become her first box office success She also appeared in the romantic comedy, Aisha, opposite Abhay Deol.